Azami, M., Monavvari Fard, F., Jeyhoni, S., Eydi, S., Reyhani, H., Ghadimi, S. (2013). The Analysis of Effective Factors on Non-Accepting of Organic Agriculture Products From the Viewpoint of Agricultural Experts (Case Study: Alborz province). International Journal of Advanced Biological and Biomedical Research, 1(3), 260-272. Mosa Azami; Feizollah Monavvari Fard; Samira Jeyhoni; Somaye Eydi; Habib Reyhani; Seyed Alireza Ghadimi. "The Analysis of Effective Factors on Non-Accepting of Organic Agriculture Products From the Viewpoint of Agricultural Experts (Case Study: Alborz province)". 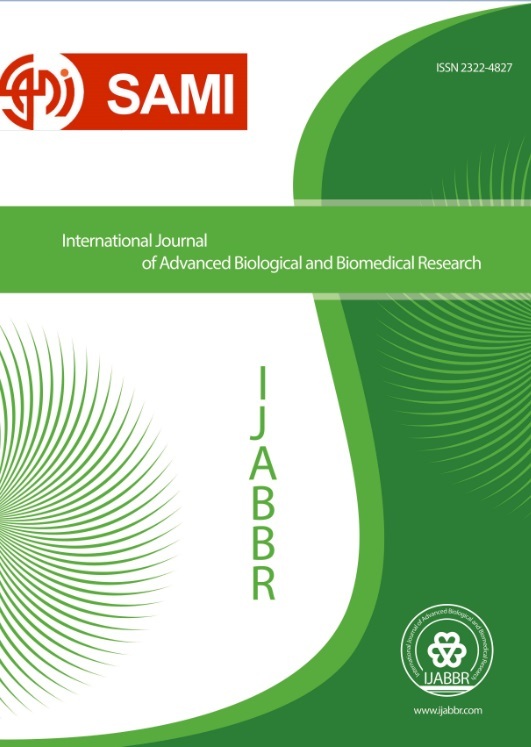 International Journal of Advanced Biological and Biomedical Research, 1, 3, 2013, 260-272. Azami, M., Monavvari Fard, F., Jeyhoni, S., Eydi, S., Reyhani, H., Ghadimi, S. (2013). 'The Analysis of Effective Factors on Non-Accepting of Organic Agriculture Products From the Viewpoint of Agricultural Experts (Case Study: Alborz province)', International Journal of Advanced Biological and Biomedical Research, 1(3), pp. 260-272. Azami, M., Monavvari Fard, F., Jeyhoni, S., Eydi, S., Reyhani, H., Ghadimi, S. The Analysis of Effective Factors on Non-Accepting of Organic Agriculture Products From the Viewpoint of Agricultural Experts (Case Study: Alborz province). International Journal of Advanced Biological and Biomedical Research, 2013; 1(3): 260-272. Today, all over the word, we see the scientists, thinkers, politicians, consumers, producers and ecologists (who support the environment) pretest against the method of agriculture, Because trying to increase the crop outcome to its maximum rate for Hectare through the irregular use of chemical input in industrial agriculture lead to a disaster in human life which will endanger the whole life on the earth in future. Therefore, the general purpose of this research is the analysis of effective factors on not accepting organic agriculture. This research is an applied one and the method used is descriptive and is a survey. The statistical population includes all the agricultural exports who work in Jihad keshavarzi of Alborz province (N=110). Based on Morgan table we selected 100 people as the sample. the tool of research is a Questionnaire whose content & surface validity was approved by the professors of Tehran university and its reliability was verified by doing a guide study of Cranach’s Alpha (between 0.71 and 0.78). In order to analyze the data, SPSS was used. The results of the research show that most of the agriculture experts have positive Attitude toward the organic agriculture (62 %) and they believe that it is necessary for the realization of sustainable development in agriculture. From the experts' point of view, the most important reasons for not accept organic agriculture include: making no distinction between organic products and other products, inability in producing ideal production if the fertilizers aren't used, inability in controlling weeds and pests when pesticides are not used and the lack of farmers level of education. 1.Abdollahi, S. (2008). Development prospects of organic farming in Iran. Ministry of Jahad-e Keshavarzi Department of Planning and Economic, Planning and Agricultural Economics Research Institute. www.agri-peri.ir. (In Farsi). 2. Angulo, A., Gil, M., & Tamburo, L. ( 2003). Food safety and consumers' willingness to pay forlabeled beef in Spain", paper presented at the 83rd EAAE Seminar, China, 4-6 September, available at: www.maich/eaae.gr. 3. Baba Akbarisari, M., Asadi, A., Akbari, M.,Fakhar zadeh, A., & Sookhtanloo ,M. (2008). An Investigation of the Consumer Attitudes and Effective Factors in Adoption of Agricultural Organic Products. Journal of Research Economy in the development Agricultural.,39(1),133-143. (In Farsi). 4. Diederen, P., H.van Meijl, and A.Wolters.(2003). Modernization in agriculture: what makes a farmer adopt an innovation? International Journal of Agricultural Resources, Governance and Ecology, 2(3-4)328-342. 5. Ghorbani, M., Kochaki, A. & Mahmodi, H. (2009). A model of estimated wheat yield in organic production, Case Study: Razavi Khorasan, Natural Science. 6(3), 23-30. (In Farsi). 6. Ghorbani , M., Dorijani, A., Koshaki, A. & Zare, H. (2009). Virtual estimation of organic cotton production in Iran., Case Study: Khorasan, Asian Journal of Plant Sciences, 7(1) 13-17. (In Farsi). 7. Gil, M., Gracia, A. & Sanchez, M. )2000(. "Market segmentation and willingness to pay for organic products in Spain", International Food and Agribusiness Management Review, Vol. 3 pp.207-26. 8. Kirner, L. & Schneeberger, W.(2000).Bereitschaft der Marktfruchtbetriebe zur Umstellung auf biologische Wirtschaftsweise in Osterreich. Analyse einer schriftlichen Befragung. (Willingness of cash crop farms to convert to organic farming in Austria. Analysis of a written survey). Die Bodenkultur51(2):135–142. 9 Lavik, R. (2002). Pro-enironmental attiudes-do they matter? ESA-Workshop-Sociology of Consumption, Bergen Norwey28-31 August. 10. Malek zadeh, Z., Ahmadi, S. & Mohammad ali zadeh, F. (2010). Organic farming. the first National student Conference of Conservation Ecology, Shahid Beheshti University. (In Farsi). 11. Molk saeidi, H., Ajili, Y. & Rezaei moghaddam, K. (2009). affective factors of agricultural experts knowledge in agriculture Organization of the Khuzestan province about Organic Farming. Journal of Research Economy in the development Agricultural., 40(2). (In Farsi). 12. Mahmodi, H., Mahdavi damghani, A. & Leiyaghati, H. (2008). Introduction to organic farming (biological). Mashad University Jihad. (In Farsi). 13. Mader, P.,D. Hahn, D. Dubois, L. Gunst, T. Alfőldi, H. Bergmann, M.Oehme, R. Amado, H.Schneider, U. Graf, A. Velimirov, A. Fließbach and U. Niggli (2007). Wheat quality in organic and conventional farming: results of a 21 year field experiment. Journal of Sci. Food Agric. 87:1826–1835. 14. Markou, M. & Stylianides, T.(2009).A plan to place successfully organic products in the Cypriot market. Journal of Development and Agricultural Economics Vol. 1(3): 055-074. 15. Meacher, M. & Willock, J. (2000). A philosophical investigation into producer attitude towards organic farming. In: IFOAM 2000 The world grows organic. Proceedings of the 13th International IFOAM conference. (T. Alfoldi, W. Lockeretz and U.Niggli). IFOAM Tholey- Theley; Basel, p. 737. 16. Moradi , J., Heydari, H., Azizi, M. & Yaghobi, A. (2011). The analysis of organic agriculture as basis Agriculture Sustainable Development from the view point of farmers. (case study: city of Diwandareh and Ghorveh)., Proceedings of the National Conference of Rural Sustainable Development, Hamedan, Bu Ali Sina University. (In Farsi). 17. Norozi, Y. & Shahbazi, A. (2010). The role of Agriculture Extension in development of organic agriculture (biological) in the rural society, Rural Development. 2(2). (In Farsi). 18. Polat, E. Demir, H. & Onus, A. N.(2008). Comparison of some yield and quality criteria in organically and conventionally-grown lettuce. African Journal of Biotechnology Vol.7 (9):1235-1239. 20. Sharifi, A., Sadati, S., Rostami ghobadi, F., Sadati, A . & Mahmodi, I. (2009). Barriers of conversion to organic farming , Case Study: City of Babol. Journal of Agricultural Research in Africa, 5(16): 2260–2267. (In Farsi). 21. Sharma, A. (2005). A handbook of organic farming. Agrobios ,India. 22. Stobbelaar, D,J., Casimir, G. Borghuis, J. Marks, I. Meije, L.& Zebeda. S. (2006).Adolescents attiudes toward organic food :A survey of 15-to16 years old school children. Internatinal Journal of Consumer studies.21:45-60. 23. Tayefesoltankhani, A., (2011). The role of organic agriculture in the beget security food. Journal of new technology, 11(13), 22-29. (In Farsi). 24. Willer, H., Yussefi-Mazle, M., Sorensen, M., (2008). The world of organic agriculture; statistics and emerging trends, IFOAM, Fibl. Earthscan, London, UK. 25. Willer, H. (2011). Organic Agriculture Worldwide Key results from the global survey on organic agriculture. Journal of Research Institute of Organic Agriculture. www. fibl.org.